Arpan is one of the only four non-profits in India addressing the often neglected social problem - Child Sexual Abuse (CSA)! In a short span of time, Arpan has evolved as a key player in child protection in India. Arpan is perhaps the largest non-profit globally working on CSA in a focused manner. It largely works with children by conducting one week training sessions in different schools for students of Grade III to X. Currently, schools in Thane and Mumbai districts are Arpan’s targeted areas. To ensure that the child is protected, sensitization programs are conducted for school teachers, non-profits working for children, parents, social workers, counselors and police officials and cadets. In addition to this, sessions are conducted with victims of CSA to avoid re-victimization, which is a common phenomenon. Arpan employs 55 individuals, of which 9 are qualified counselors. Arpan has a top-quality team to develop in-house content to educate people on different facets of CSA and its impact on the child. They follow a strict recruitment process and students are inducted either from Tata Institute of Social Science or Nirmala Niketan College of Social Work. Arpan reached out to over 31,000 children and teens during FY14 through its various awareness and training programs. About 11,000 individuals benefited through the public advocacy program and 38,000 through social media. For the first time, Arpan stepped out of Mumbai and Thane to conduct awareness sessions in seven other cities across four states i.e. Maharashtra, Chhattisgarh, Gujarat and West Bengal. Arpan was invited for consultation at the National Level by the Ministry of Women and Child Development in Delhi to discuss the rules and regulation of POCSO Act (The Protection of Children from Sexual Offences). The team of counselors at Arpan handled 1,384 cases of Sexual Abuse during FY14. 3,800 parents, teachers and other adults benefitted from awareness session programs. Out of these, 1,400 were police cadets and other officials. Arpan’s YoY total income shot up by 67% in FY14 to Rs16mn largely owing to 77% YoY increase in grants received from institutional donors (Rs14mn in FY14 v/s Rs8mn in FY13). Share of income contributed by institutional donors has grown consistently each year for the past four years – from 37% in FY10 to 85% in FY14. This upward movement strongly suggests the faith and confidence of institutional donors in Arpan’s approach to prevent the occurrence of CSA. In FY14, Rs14mn was received from foreign institutions v/s Rs5mn from local institutional funders. Of this Rs19mn, Rs13mn (72%) was utilized in FY14. The unspent amount of Rs5mn is recorded in the Balance Sheet under the head ‘Child Sexual Abuse Fund’. Besides this, interest income also went up by 129% in FY14 following an increase (+44%) in investments (Fixed Deposits) in FY14 to Rs12mn. 86% of total expenses in FY14 was spent on direct program activities. These activities included: personal safety education, awareness & capacity building sessions, policy advocacy, research, and resource development. With consistent increase in income, Arpan has demonstrated proportionate growth in Direct Program Costs each year – has increased from 70% FY11 to 86% in FY14. Salaries of staff directly involved in above mentioned activities is included in the project expenses, and not available separately. Overheads accounted for only 4% of total expenses in FY14; indicating efficient use of funds received from donors. Overheads have been maintained below 10% since FY12. Intangible assets valued at Rs2mn are included in fixed assets worth Rs3mn in FY14. These include content for personal safety education (98%) and the balance constitutes of the website and logo. 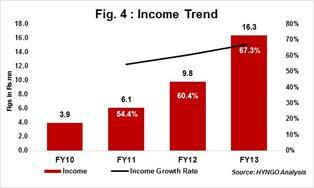 Arpan posted a 4-Year income CAGR of 61% for the period FY11-FY14. The growth in this period can be attributed to continued support by committed donors of Arpan such as R. Jhunjhunwala Foundation, Marshall Foundation, Hemendra Kothari Foundation, Hilton Foundation, Global Fund for Children and Connect India. Arpan’s self-sufficiency ratio (SSR) has been weakening each year since FY11. 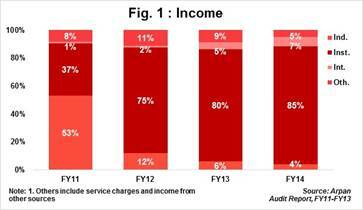 It has tumbled from 68% in FY11 to 16% in FY14; indicating need to generate own income (service charges, interest income, donations etc.) and reduce the increasing dependence on institutional donors. Arpan had strategically opted to choose the institutional route for funding its operations as the management was cognizant about the reluctance of individual donors to support a cause like CSA. Therefore a lot of time was invested in identifying and retaining the right institutional partners. Sources we interacted with at Arpan shared that the organisation has a steady cash flow for the next three years and would focus on generating alternate source of income. Arpan’s biggest challenge is convincing corporates to participate in this movement of creating awareness on CSA. As CSA is a sensitive issue, most organisations are reluctant to support the cause. To address this, Arpan has initiated talks with a few corporates to conduct workshops on sensitizing employees on CSA. The Board consists of five trustees and is responsible to guide the management and staff members. Collectively, the Board brings expertise in the fields of education, marketing, operations and business management. The trustees are not related to each other. One of the trustees is a nominee appointed by the R. Jhunjhunwala Foundation. His role is limited to providing strategic guidance and suggesting expansion plans for Arpan. The Board meets once every quarter and it ensures that all five members including the management are present for all Board meetings. Minutes of the meetings are circulated. Founding member, Ms. Pooja Taparia who is also the CEO was awarded the prestigious ‘Karamveer Puraskaar’ award by I CONGO in 2010 for her work in the child abuse domain. Arpan is a well-structured, professionally run, organisation, with 55 qualified staff members. Arpan’s reporting standards are one of the best in the sector. Arpan is listed with Credibility Alliance (desirable norms).